How do Words Reflect America’s Diverse Culture? Your contributions will enable DARE to continue collecting material, doing research, and publishing new and revised entries on the DARE website, where they are freely available. About $250K/year will maintain the project with its current staff of three full-time members and allow it to continue the work that is in progress. Significantly more funding would allow it to increase the staff, transcribe the DARE audio recordings, and take the online survey nationwide. A dictionary of the words used somewhere—but not everywhere—in the U.S. 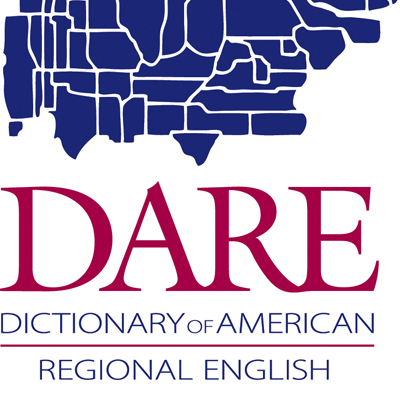 The Dictionary of American Regional English (DARE) is a monumental reference work devoted to documenting the regional and folk vocabulary of the United States—words, expressions, pronunciations, and grammatical forms that are limited to particular geographic areas or cultural groups, or to the colloquial language in general as opposed to the standard literary language. No other reference work comes close to DARE in scope and comprehensiveness. The Dictionary (six volumes and an online edition, Harvard University Press, 1985–2013) has garnered high critical praise and is widely regarded as the authority in the field. DARE comprises more than 40,000 entries with nearly 60,000 distinct senses. The meaning, history, and distribution of every sense are illustrated as fully as possible with more than 230,000 citations from a wide variety of sources, including regional fiction, diaries, letters, memoirs, histories, travel books, newspapers, and journals, as well as the DARE fieldwork carried out in 1965–70 and the scholarly literature on U.S. dialects. Many entries that incorporate data from the DARE fieldwork also include maps that show the distribution of informants graphically. In the online version, users can also create their own maps directly from the fieldwork data and listen to over 5,000 audio clips from the recordings made during the fieldwork. Where appropriate, labels summarize regional and social distribution. Etymologies provide a further historical dimension, often revealing origins in the regional dialects of Britain, the non-English languages of other immigrants, or the indigenous languages with which early settlers came in contact. Variant forms and pronunciations are thoroughly documented. Copious cross-references link related entries. Language reflects and embodies culture, and DARE treats a part of our language that is central to understanding the complex cultural history of our country, illuminating patterns of settlement and migration, of cultural borrowing and innovation. It is a critical resource for students of linguistics and language variation, of cultural history and geography, and of American literature, but its utility is by no means limited to these fields. It has proved invaluable to actors, detectives, police officers, lawyers, physicians, librarians, and historians, among others. At the same time, it also has broad popular appeal: awareness of language variation is almost universal, and DARE offers accessible and objective information for all who are curious about the differences they hear around them. The wide variety of people who find DARE useful or interesting is well shown by the Users’ Comments quoted on the DARE website. DARE is frequently referenced by language columnists, bloggers, and journalists. William Safire was an enthusiastic supporter until his death in 2009, and regularly cited DARE in his “About Language” column; current supporters and users include Ben Zimmer, language blogger, language columnist for the Wall Street Journal, and frequent participant in the podcast Lexicon Valley, Allan Metcalf, language blogger for the Chronicle of Higher Education, and Grant Barrett and Martha Barnette, co-hosts of the public radio program A Way with Words. The DARE staff is committed to updating the Dictionary by adding new entries and senses, and by making significant improvements to old ones. Despite all the praise for what has been done, they know—more so than anyone else—how substantially it can still be improved. Improve and Update DARE Material - Much new DARE material has already been collected. The DARE staff never stopped actively collecting new citations, even for sections of the alphabet that had already been published. By the time active planning for revision could begin in mid-2013, this material amounted to roughly 50,000 citations, and thousands more have been added since then. This material comprises not just later citations, but many improvements for existing entries, as well as material for new entries. Another source of new (and up-to-date) data is the recent Online Survey of Wisconsin English, which not only collected material to show how language has changed in the last half century, but also asked questions about things and concepts that didn’t exist when the original fieldwork was done. All of this represents a huge investment in the future that should not go to waste. Utilize New Research Sources - Far better resources for doing further research now exist, mainly due to the Web. Personal pages, blogs, discussion lists, local newspapers, and so forth are a rich source for documenting the current state of the language. At the same time, the proliferation of Web-accessible, searchable text libraries of books, magazines, and newspapers (for instance, a few of the largest and most productive include Google Books, The Making of America, American Periodicals Series, America’s Historical Newspapers, Chronicling America, and NewspaperArchive) has revolutionized our ability to trace and document the earlier history of words and phrases. A beginning was made in using these resources during work on Volume IV, but they could only be fully utilized in the fifth volume (Sl–Z). Publish New Entries - The work that has been done within the last year proves that there is still a great deal to be added to our knowledge of the regional and folk speech in the U.S. New and revised entries are being published in a series of Quarterly Updates on the DARE website, where they are, and will remain, freely available. (Harvard University Press has said that these will also be incorporated in updates to the full text of the Dictionary at www.daredictionary.com). As of March 2016, three updates have been posted, comprising about 180 entries, and another set is coming soon. There is no better way to see directly what the DARE project is about than browsing through these fascinating entries; here is a short list that illustrates the wide variety of new material that is being added: beau dollar, beaverslide, bodega, budge, candle fly, crotch horn, la-la, mop sauce, Zion curtain. Make Audio Recordings Publicly Available - As part of the DARE fieldwork carried out in 1965–70, 1,843 audio recordings were made of respondents both reading a set passage and engaging in free conversation with the fieldworker. Besides the obvious value of these recordings for investigating regional pronunciation and how it has changed over time, they include a great deal of very interesting oral history material. In the past, because of privacy concerns, scholars and other interested people could only access these recordings by special arrangement and after signing a confidentiality agreement. Despite these difficulties, dozens of scholars and other interested persons have already used them. But a project is underway to “bleep out” any personal or sensitive material in the recordings, and when this is done they can be made available on the Web to anyone who wants to download them. A detailed topic index to the recordings already exists, but some financial resources will be needed to create an effective website. The accessibility of the recordings would be greatly increased if they could be fully transcribed; this is something the project would like to do, but cannot undertake without an assurance of adequate funding for a number of years. (Visit Audio Samples to hear a few excerpts from DARE tapes with accompanying transcription; there are also links to further samples). Joan Houston Hall first learned about DARE while a graduate student at Emory University, doing fieldwork for the Dialect Survey of Rural Georgia. When Frederic Cassidy, DARE’s founder, was looking for someone to help him edit the Dictionary, she immediately applied for the job. She was hired and has never regretted that decision. Hall found the combination of historical research and contemporary fieldwork to be extremely satisfying work. In almost every instance, lexicographers will say they fell into their profession by accident. That was certainly true for her. It is not a profession for which there are preparatory programs or degrees: everyone learns on the job, and every dictionary has its own focus, rules, and format. As the project added more staff, she became the teacher of the new editors. Over time, Professor Cassidy also brought her into the administrative parts of the project, which included supervision, fund-raising, and public outreach. Her first opportunities to talk about DARE on the radio or television inevitably filled her with apprehension; forty years later, she accepts them with pleasure. Although she is officially retired, Hall continues to work with the project as a volunteer. George Goebel received his Ph.D. from the University of Wisconsin–Madison in Classics, with a dissertation on ancient Greek rhetorical theory. When his job search was unproductive, a chance meeting led him to apply for what he thought would be a temporary job as an Assistant Editor of DARE; this was the beginning of a lifelong obsession with lexicography. It is the central position of language in culture, as a manifestation of it and as a medium for its transmission, that makes it both important and endlessly fascinating to him. Every word, every phrase has its own history, and that history is always in some way or another a little slice of cultural history. When Elizabeth Gardner left her home state to attend college, her interest in regional English was sparked. During her first day in the dormitory, she inquired, “Is there a bubbler on this floor?” She was amazed to be asked in return, “You’re from Wisconsin, aren’t you?” As she got to know students and professors from other parts of the country, Gardner became fascinated with their speech patterns and the unfamiliar expressions they used. Several years later she started working for DARE, where she continues to marvel at the wonderfully diverse ways people express themselves across the U.S. Though she started as a proofreader to help finish up the publication of Volume V, Julie Schnebly finds that her roles and responsibilities have adapted as much as DARE has in the last nine years. Depending on the day, she might be making maps of survey results, updating website content, preparing audio recordings, importing quotations for Digital DARE updates, or working with volunteers and interns. It is difficult to put into words what working for DARE means to her; ironic, since she is surrounded by them every day. Of course, for a logophile, it is a splendiferous, rip-roaring high-heeled time, but she thinks it is more than that. When she receives an email from someone who bonded with her grandmother over the word “pipjenny,” or hears an audio recording of a woman who witnessed the origins of the phrase "Black power," or observes the voracious online appetite for a “pop” vs. “soda” map, she knows that the DARE project provides something significant to our shared American experience: something that can be put into words. To see the published Dictionary, go to daredictionary.com. This site belongs to Harvard University Press. Full access requires that you be a subscriber or belong to a subscribing institution, but all users can access a generous sample of entries, as well as all the introductory and supplementary material (under the tabs “About DARE” and “Resources”). To learn more about the DARE project as a whole, go to dare.wisc.edu. This site belongs to the project; this is where the Quarterly Updates are posted, as well as a great deal of other information about the staff, the history, and the current activities of the project. For press notices of DARE, as well as quizzes and word lists, visit https://dare.news.wisc.edu/.